The Turtle is a Female! On June 11 my Daughter and her twin sons found a turtle in the middle of the road. Not wanting to see harm come to the Turtle they brought it home, and it’s made itself comfortable running around the backyard, jumping in and out of the pond as needed, and chasing Peanut dog around the yard. This turtle is not that small, about 12 lbs in weight and a shell of about 18″ big. We’ve determined it to be a Texas Soft-Shell turtle. It doesn’t really have a shell but a very hard skin covering on the back, which feels like leather when wet. 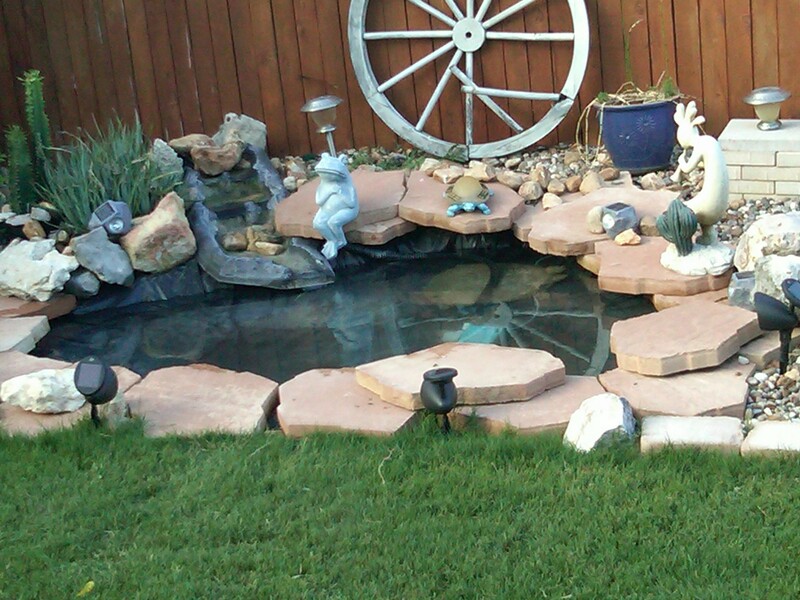 It eats the bugs, crickets, and small fish we throw in the pond. It seems harmless although a bite from her would probably hurt, but a good learning experience for the boys. 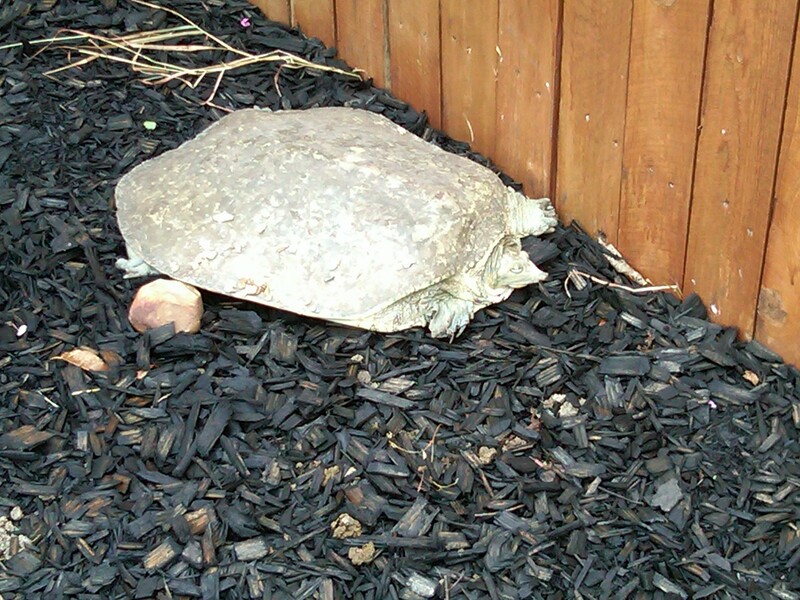 We’d noticed over the last 2 weeks or so the turtle preferred to stay under the deck. 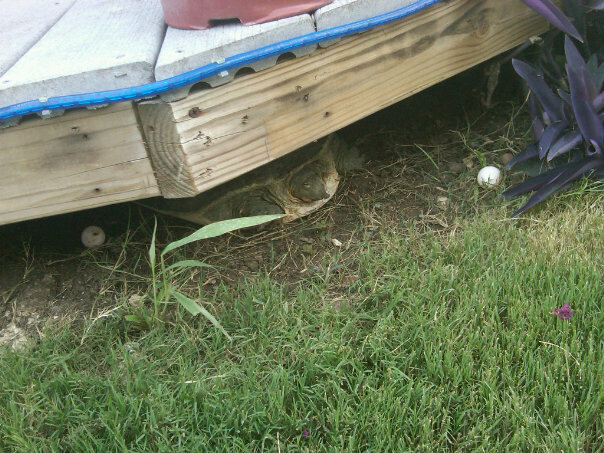 We assumed it was due to the hot temps, but it appears the Turtle made a nest under the deck, and started laying eggs. This little process answers the question of is it a he or a she, and as of today her name is MsT. So far there are only 2 eggs that I can see, they are a little smaller than a ping-pong ball. After a couple of quick Google searches I know she could lay as many as 8 eggs per hutch, she could do this twice a year, she is at least 4 years old, and she could live to be 30-50 years old. I do not know if the eggs are fertilized, mating season is in May and we picked her up in June, but it is the egg laying season for turtles. After reading on the hatching process and the risk to the eggs left on the ground I think I will collect the eggs up and try to keep them safe for hatching (if they do), which will occur sometime in mid September. It could be a case of her laying eggs that are not fertilized, which means the eggs will eventually either collapse on themselves or not hatch at all. MsT nesting under the deck in the picture above. You can the 2 round white eggs, one on each side of her. This entry was posted in Thoughts and tagged eggs hatching process, raising a turtle, Turtle. Bookmark the permalink. 1 Response to The Turtle is a Female!